Last month, MY Ocean Camp was delivered in Steenwijk. Less than a month later, this beautiful yacht was already spotted in Copenhagen. Proof that Steeler Yachts really does deliver seagoing vessels is evident from the further itinerary of this NG59 S-Line. In fact, in just a few months, MY Ocean Camp will even be on display at the Cannes Boat Show. 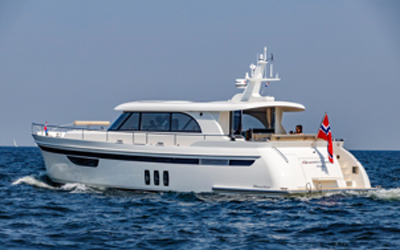 In consultation with the shipyard and DMS, interested customers will be able to plan a sea trial on board out on the Mediterranean Sea in order to experience the fantastic sailing characteristics of this S-Line. This beautiful yacht, whose sister ship was recently described as a “Faultless Yacht” by the Dutch newspaper and news site ‘De Telegraaf’, is not called “Ocean Camp” for nothing! “Recently we were called up by the owner of this yacht to tell us that he was very pleasantly surprised by the damping that the MagnusMaster stabilisers generated on the boat. Even with waves of 2.5 to 3 meters, Ocean Camp remained very stable and comfortable to sail. At that time, the owner was sailing over the Bay of Biscay”, explains Niels Tuininga of Steeler Yachts.